This coconut Jollof rice is another version of Jollof rice in which the water in the plain Jollof rice is substitute with coconut milk. Many calls this rice, coconut rice but you have to remember that it is totally different from the Indian version of coconut rice. 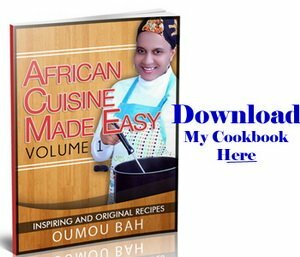 In some African countries like Cameroon, this is normally cooked with meat but I am going to make mine totally vegetarian but note that you can add some meat if you wish. Before you start the cooking process, soak the rice in hot water with a tsp of salt and one bay leave. Step 1: Fry the onion and garlic for few minutes. Step 2: Add the mashed tomatoes and tomato paste and fry for 5 min. Step 3: Add ½ cup of coconut milk and cook until it’s thicken. Step 4: Add the rest of coconut milk with the ginger, bay leaves, black pepper and the vegetables. Then bring to boil. Step 5: Add the rice in the cooking pot and salt to your taste. Stir with a fork and let it cook until the rice has absorbed almost all the liquid. Step 6: Cover the rice with a foil or plastic bag and replace the lid. Cook for 20min or until done on very low heat. 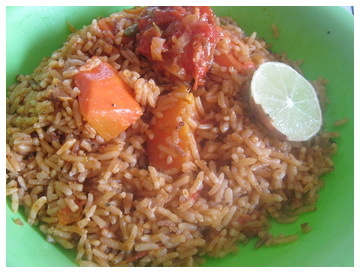 When you coconut jollof rice is ready, you can serve on its own or with some meat or fish .